A new image from Empire magazine has surfaced online which shows us a little more of that Batman dream sequence from the Batman Vs Superman trailer. So far we know Doomsday appears in the movie to give team trinity a warm up but director Zack Snyder has a lot more planned. Snyder doesn’t like to give anything away. When he made the Watchmen movie he even changed the ending of one of the most popular graphic novels in print just to give the audience a surprise. The new Empire magazine picture shows Batman over looking a giant Darkseid insignia marked in the ground with a burned out city in the far distance. This could be the final piece of the puzzle since those flying creatures in the dream sequence appear to be Darkseids minions the Parademon. 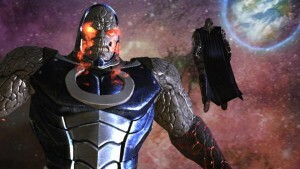 Personally I think they are teasing Darkseid and saving him for the Justice League movie. The big final battle of Batman vs Superman will be with Brainiac. Although we haven’t seen any evidence of this he would pull a lot of the current story together. In the new 52 it was Brainiac who was originally directing Lex Luthor and giving him the knowledge to defeat Superman. With Doomsday originally being a Kryptonian invention it could be that Brainiac tells Lex how to create him using General Zods DNA. Saving an intergalactic threat like Darkseid for the next movie would also give them a great reason to introduce the Green Lantern Corps which have been confirmed to be in the Justice League movie. Either way it looks like the DC movie universe is going to get a lot bigger very soon.